If you want one of the best luxury event vehicles in its class, the Stretch Chrysler 300C hire car is for you. This vehicle will ensure that all eyes are on you at your next event, and you’ll be riding in style the whole way there. The Chrysler 300C hire car can comfortably seat up to 12 passengers, which means your entire party will be driving in style together. They come equipped with fiber optics, numerous music and video capabilities, and of course — a beverage bar. There is plenty of room for all 12 passengers to fit comfortably and with ample leg room, and the sleek, classy interior will make it difficult to leave upon arrival at your destination. 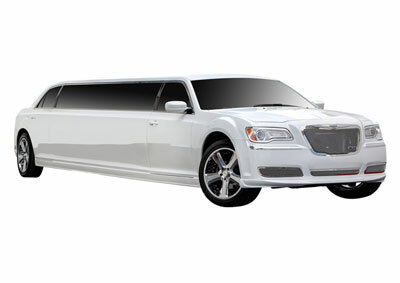 It’s ideal for wedding parties, large group events, or a classy drive to the airport. You won’t have to worry about sound since the vehicle is designed with you in mind. You’ll enjoy a quiet, smooth ride in the back of this beautiful luxury vehicle. In addition, your party will enjoy a privacy divider from the front of the vehicle, and climate control to ensure that everyone is comfortable. Upon rental, you can be sure that your stretch is in the best condition for your ride. Let our Chrysler 300C chauffeurs take you from A to B with Prestige Chauffeurs premium Chrysler 300C hire cars today.